In medium bowl, mix all Shrimp ingredients except oil; set aside. In 10-inch skillet, heat 1 teaspoon oil over medium-high heat. Add bell pepper and onion; sprinkle with 1/8 teaspoon salt and 1/8 teaspoon pepper. Cook, stirring frequently, 3 to 5 minutes or until crisp-tender and beginning to brown. Remove from skillet to bowl; cover to keep warm. In medium microwavable bowl, microwave beans uncovered on High 1 to 2 minutes or until hot, stirring halfway through. Meanwhile, return skillet to heat. Add 1 teaspoon oil to skillet. Add shrimp mixture. Cook shrimp 4 to 5 minutes, stirring occasionally, until pink and liquid is evaporated. Remove from heat; cover to keep warm. Add rice and remaining Rice & Beans ingredients to beans in bowl; mix well. Divide vegetables, rice mixture and shrimp evenly among 4 serving bowls. Top with Toppings. 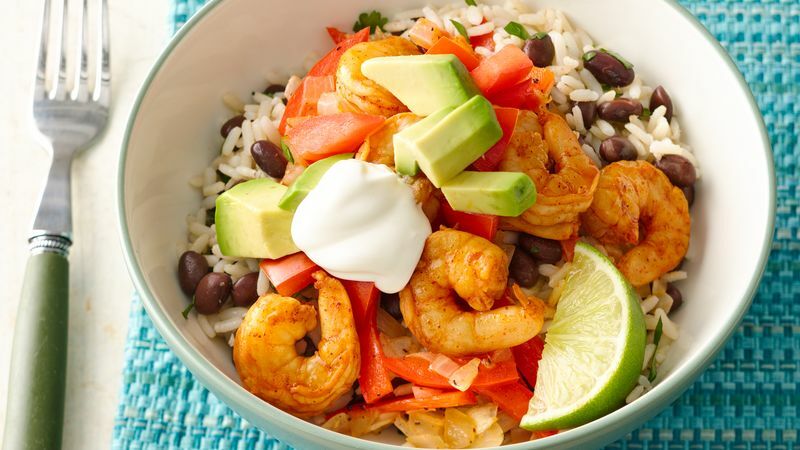 Turn this shrimp bowl into a shrimp burrito by simply wrapping everything in a gluten-free tortilla. Shrimp companies define small, medium and large shrimp differently. For this recipe, look for packages that are around 41 to 50 shrimp per pound. This recipe can easily be doubled and served as a burrito bar to a larger group.